SEVENTEEN of the region’s top students, including two Vincentians, were recently recognized for their academic excellence in 2018. The students, journeying from Guyana, Jamaica, Trinidad and Tobago, St. Kitts Nevis, Antigua and Barbuda and Grenada were praised during the Caribbean Examination Council’s (CXC) presentation of awards for outstanding performances in the May/June 2018 examinations. The Caribbean Secondary Education Certificate (CSEC) most outstanding candidate overall was Keondre Herbert of the St Joseph’s Academy, Antigua and Barbuda. Keondre achieved Grade I passes in 20 subjects. The most outstanding CSEC candidate in sciences was Daniel Baldeo-Thorne of Queen’s College, Guyana. He had 13 Grade I’s and two Grade II’s. Rebekah Persaud of St Roses High School, also in Guyana, won the award for Most Outstanding CSEC Candidate in Business Education with nine Grade I’s, two Grade II’s and one Grade III. Salma Majeed of ISA Islamic School, Guyana copped the award for the Most Outstanding CSEC Candidate in Humanities with 18 Grade I’s. Kae-Shanae Virgo of Montego Bay High School, Jamaica won the Best Short Story award in the English A examination with a story entitled “Betrayal.” Two other Jamaican students copped the Visual Arts awards. Okeen Wallace of St George’s College walked away with the Best 3-Dimensional Visual Arts Award with a piece from the Sculpture and Ceramics Option entitled “The Forest”, while Danielle Gennard of Wolmers Girls’ School copped the award for the Best 2-Dimensional Visual Arts work with her creation entitled “Deal with the devil” from the Painting and Mixed Media Option. The CSEC school of the year award went to St Joseph’s Academy of Antigua and Barbuda. The Caribbean Advanced Proficiency Examination (CAPE) awards were also distributed. Aadilah Ali of Queen’s College, Guyana is the 2018 winner of the Dennis Irvine Award, the symbol of academic excellence at the CAPE level. Aadilah achieved Grade Is in 14 Units and Grade 2 in one Unit. Aadilah is the second Queen’s College, Guyana student to win the Dennis Irvine Award, following Cecil Cox in 2015. She also copped the award for Most Outstanding Candidate in Natural Sciences. Another student from Queen’s College, Guyana took the award for Most Outstanding Candidate in Mathematics. Rajiv Muneshwer achieved Grade Is in 12 CAPE Units. Rajiv received the RM Results CAPE Mathematics Award. RM Results, a UK-based company began sponsoring the award in 2017. Trinidadian students won the other awards. Mikhaili Toney of Presentation College, San Fernando, Trinidad and Tobago took the award for Most Outstanding Candidate in Humanities. He will receive the Hodder Education CAPE Humanities Award. Kirese Narinesingh of Naparima Girls’ College took the award Most Outstanding Candidate in Language Studies with Grade I in eight Units. Seline Sundar of Lakshmi Girls’ Hindu College continued that school’s dominance of regional business awards. Seline achieved Grade Is in eight CAPE Units. Selline will receive the ACCA CXC Business Studies Award 2018, the second time the award will be presented. A student from St Joseph’s Convent, Port of Spain, Jade Lakhan, secured the award for Most Outstanding Candidate in Environmental Science. Jade achieved Grade Is in eight CAPE Units. 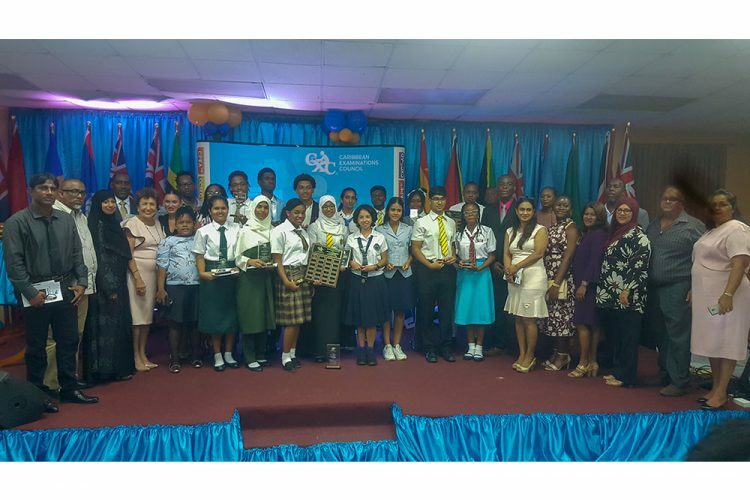 Queen’s College, Guyana received the award for CAPE School of the Year 2018. The Caribbean Certificate of Secondary Level Competence (CCSLC) top awardees for 2018 are Daria James (most outstanding female) of the Washington Archibald High School, St Kitts Nevis. The most outstanding CCSLC male student is Christian Meneses-Chow Chung of the Presentation Brothers College, Grenada. Vincentians Ryanna Glynn as a student of the Girls’ High School and Nicholi John as a student of St Vincent Grammar School were recognised by CXC and Association of Certified Chartered Accountants (ACCA) for their performance in Principles of Accounts (CSEC). The event heard addresses from Prime Minister Dr Ralph Gonsalves; Permanent Secretary Ministry of Education, National Reconciliation and Information Morine Williams; Ministry of Education Jimmy Prince, Registrar Caribbean Examination Council Glenroy Cumberbatch and Chairman Caribbean Examination Council Sir Hilary Beckles.